On Tuesday March 29th, our office counter will be closed at 18:00 to prepare for this event. 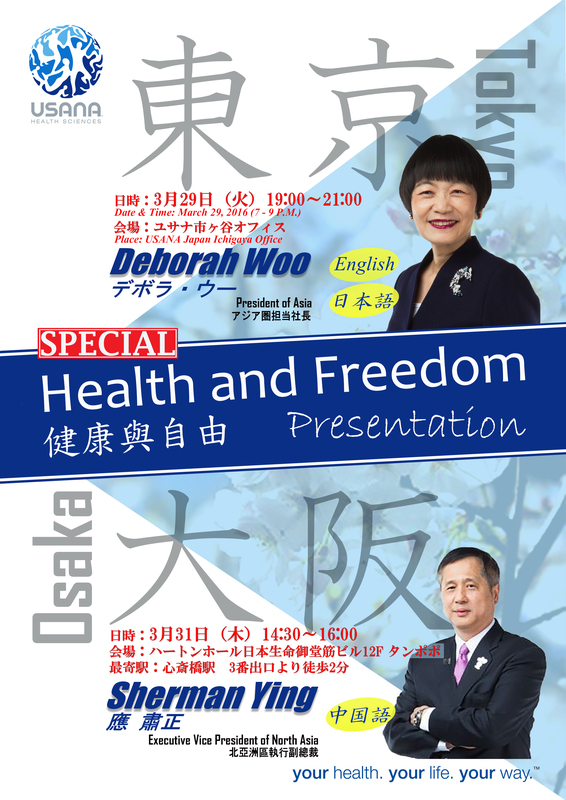 USANA's Top Management who leads the growing Asian marekts; The president of Asia; Deborah Woo and the Executive Vice-President of North Asia: Sherman Ying will hold Special Seminar in coming March. Do not miss out this special opportunity to learn from Top Management! As President of Asia, Deborah currently oversees all operations for the Hong Kong, Japan, Taiwan, South Korea, Singapore, and Malaysia. Nearest Train Station: Midousuji-Line, Shinsaibashi station, 2min walk from 3A exit. Sherman currently oversees all operations for the Taiwan, Hong Kong, South Korea, and Japan market. Do not miss 4th Walking Event! Saturday March 26th would be the best timing to enjoy "Cherry-Blossom Viewing" by walking the popular Cherry-Bloosum Viewing area around "Chidorgafuchi", Yasukuni Shrine and the Imperial Palace. April Seminar Schedule is available now. Now you can personalize USANA seminars by choosing your preferred date, topic and language now. Each request has to be made at least 1 day before each seminar. To request your seminars, you can call Customer Service or use this online request form. You can book and use USANA office unless USANA seminar request is not made. The current seminar schedule is available in this blog or HUB. Then March Grand Sumo Tournament in Osaka has been started from Sunday March 13. "Kotoshigiku" is currently "Ozeki" which is the 2nd highest rank. However he has a chance to be promoted to "YOKOZUNA" (the highest rank) if he won the the championship again. Team USANA: 700 Top Professional Athelets who relay on their healthy to USANA products. Sumo Wrestlers in "Sadogatake Sumo Staple' are ones of them. In Japan, 2 major ”CoQuinone 30" nutrients in "CoQunone30"; Coenzyme Q10 and Alpha-lipoic acid have been used for medicine until 2003. It is known that Coenzyme Q10 supports heart function. Alpha-lipoic acid supports liver function. You can enjoy FREE shipping Fee February 29 through April 1st now!